If you have any questions or want to enquire about dates, use our form to contact Philippe Augais or see their website for more information. 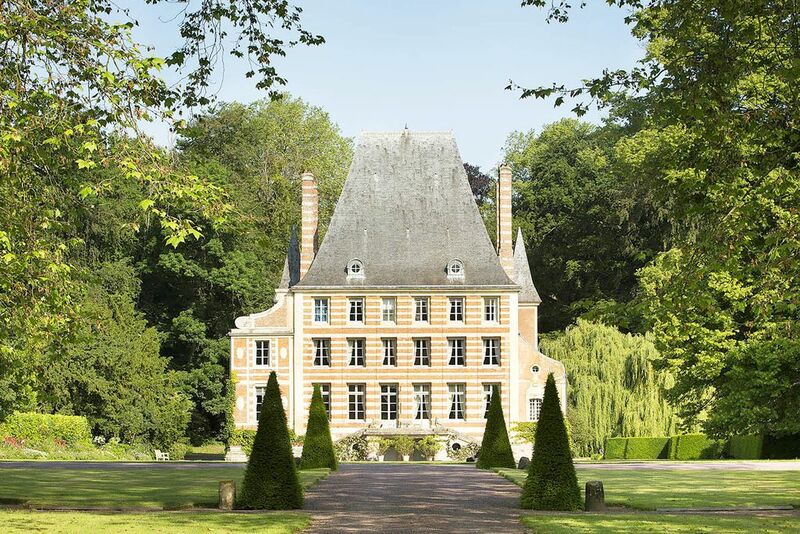 Down the plane-flanked drive to an immaculate Renaissance château in 50 acres of harmonious grounds. Find painted 17th-century beams in perfect condition, a panelled library, a powder-blue dining room, and fireplaces imposing and theatrical – panache, elegance and a huge amount of fine château character. There’s more: heads of antelope and oryx jumping out of the walls, a curled up fox on a sitting room sofa, a cheetah on a branch hitched up high on the library wall: the unmissable presence of the hunter’s passion. Here live the Augais family (she gentle and artistic, he ruler of the roost, both great travellers) with horse, hens and handsome gundogs. In big peaceful bedrooms with tall windows are chestnut floors and grey-washed beams, oriental carpets, quilted bedspreads, boudoir armchairs, deep baths (with shower attachments) and exquisite curtain tassels. Take a dip in the discreet pool; set off for culture in Caen. Super breakfasts come with homemade jams; there’s no table d’hôtes but restaurants all around. Marvellous. The chateau and the lovely hosts Philippe and his wife provided two of the best days of our vacation this past July. The setting is that of a glorious country manor house and the rooms are luxuriously furnished and extremely comfortable. The beds were like those in a five star hotel and with the large rooms, I felt as if we were royalty. I don't believe I have every stayed in such a beautiful and warm hotel as this chateau. The large breakfasts that come with your lodging were delicious and bountiful. I spend each summer in France and this was the best experience ever! "Pegasus bridge" is just a few minutes away in the grounds of the Pegasus Museum. The successful taking of the bridges played an important role in limiting the effectiveness of a German counter-attack in the weeks following the Normandy invasion. Two gliders landed on the farm of Béneauville in the night of 5th June 1944 with a lot of damage. In 1897 the Château de Béneauville was home to "l'Orphelinat des Arts", an orphanage created by a group of female artists to educate and look after children had by artists or writers.